Loom & Leaf is an ultra-luxury memory foam mattress brought to you by Saatva, named by Forbes as one of the top 100 companies to watch in 2015. 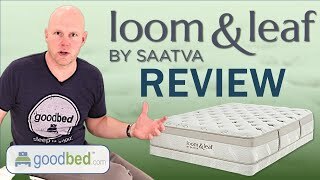 To decide whether Loom & Leaf is the right choice for you, read GoodBed's expert review of the Loom & Leaf mattress or watch our in-depth video review of the Loom & Leaf mattress. Is Loom & Leaf the right bed for you? Based on 281 real owner experiences with this brand. How do people like you rate their Loom & Leaf mattress? Mattresses are personal. Filter the 281 Loom & Leaf ratings by sleep position, weight, age, gender and more to find the ones that are most relevant for you. Loom & Leaf mattresses are recommended by 59% of owners on GoodBed (based on 281 ratings + 11 reviews). Want more reviews from Loom & Leaf mattress owners? Do you have something to say about your Loom & Leaf mattress? Write a Review! Cover and Quilt: Breathable, organic cotton covering and natural thistle flame retardant keep you comfortable, cool, and safe. Lower Foam Comfort Layer: 5 lb ultra-premium memory foam provides deep contouring support. Top Layer of Flat Gel: Proprietary medical-grade gel keeps you cool, provides added spinal support, and promotes good circulation. Upper Foam Comfort Layer: Plant-based premium upper foam layer of convoluted, gel-infused foam with airflow channel. Bottom Foam Support Core: High-density foam base and transition layer add additional support. Note: The product line specifications above were derived from the active Loom & Leaf models listed on GoodBed. As a result, these details may not be comprehensive and may not apply to all Loom & Leaf models. If you are seeking specifications for a particular Loom & Leaf mattress, please search for that mattress by name on GoodBed, or check with your local Loom & Leaf dealer. Loom & Leaf is a mattress manufacturer founded in 2015 that is based in Westport, CT in the United States. Loom & Leaf is affiliated with Saatva and Zenhaven. Have an update or correction to our information about Loom & Leaf? If so, please take a moment to suggest an edit. Loom & Leaf mattresses sold by Loom & Leaf come with a 120-night in-home trial. Your mattress can be returned for any reason during the 120 night in-home sleep trial. Only the Lineal adjustable base cannot be returned or exchanged. For returns, L&L will pick up your mattress and provide a full refund minus a $99 handling fee. Loom & Leaf mattresses are only available online.